From the sublime to modernism: Peder Balke at the National Gallery and Emily Carr at the Dulwich Picture Gallery. Off the beaten track: Antonia Jackson discovers the beautiful landscapes of Peder Balke (1804-1887) at the National Gallery and Emily Carr (1871-1945) at the Dulwich Picture Gallery. 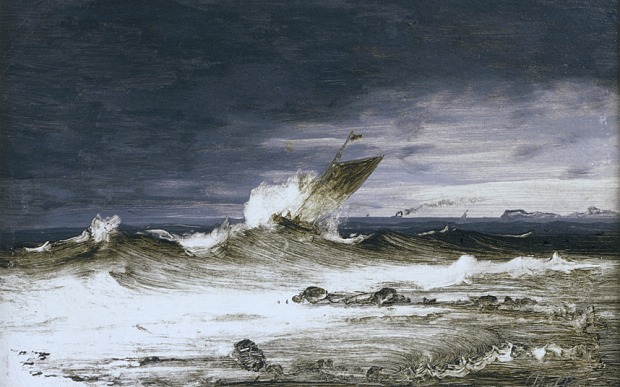 As I was catching up on exhibitions over the Christmas break, I came across the paintings of the Norwegian Peder Balke at the National Gallery, which turned out to be an exciting discovery. While his earlier paintings (1840s to 1850s) clearly remind of German Romantic paintings such as Caspar David Friedrich,Turner’s landscapes or Van Ruisdael’s Dutch seascapes, his later works (beyond the 1860s) feel extraordinarily contemporary. While his painting technique appears more constrained in his earlier works, it becomes much more adventurous from the 1860s onwards: the colour palette shrinks with hues of black, white, blues and greens dominating; the white primed background is used to create light effects instead of building up layers of paint; his brushwork becomes more expressive as the oil paint appears very diluted and thinly applied like watercolour washes. His painting North Cape (1870s) is particularly striking. Presented alongside earlier paintings from the same landscape, it clearly highlights the evolution of Balke’s painting technique. It feels as if Balke sculpted the rocks and cliffs out of thin layers of black and ultramarine blue oil paint washes. The shape of a steamboat is visible in the distance, while a sailboat is present in the foreground, echoing some of Turner’s work. The result is a ghostlike, dreamlike, surreal painting. His small oil paintings on cardboard, especially those of the Northern Lights, are equally striking and experimental, and it is this innovative and economical use of paint that makes his work particularly interesting and modern: one can’t help but think about the work of contemporary Swedish painter Mamma Andersson for instance. 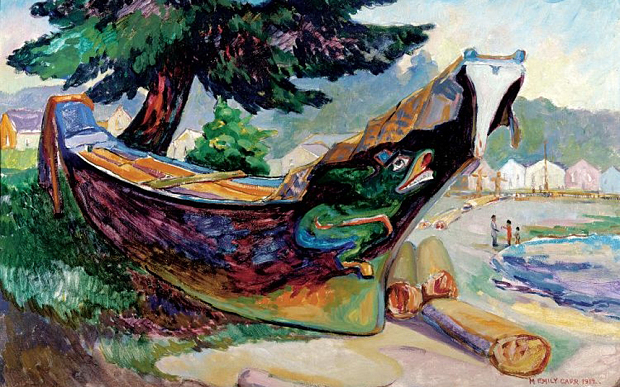 Another landscape painter currently on show is Emily Carr at the Dulwich Picture Gallery. Painting in British Columbia, Canada, a generation later, she was also in search of spirituality in nature at the onset of modernism. Inspired by the traditions of the threatened indigenous American Indians, she painted lush forest in vivid greens with bold gestural brushstrokes to create a deliberate sense of movement that engulfs the viewer. Her subject matter ranged from the forest to seascapes to Totem poles and canoes. While she trained in England and France, hence the influence of the post-impressionists and fauvists in her early work, her painting really matured later on under the influence of Lawren Harris, one of the members of the Group of Seven, whom she had come to exhibit with on the East coast. Her work became more angular, with simplified and stylised forms, a stronger sense of movement. At times, it reminds of futurism and cubism, verges onto abstraction or echoes Edvard Munch’s work, another Norwegian painter also influenced by post-impressionism. The exhibition is organised thematically (the forest, Skidegate totem poles, sea and sky) rather than chronologically, which can be confusing due to the variety of her style and experimentation. The presence of wooden carved Native American Indian’s votive objects alongside the paintings is a welcome addition to the exhibition. This entry was posted in Exhibition and tagged Art, artists, Dulwich Picture Gallery, Emily Carr, exhibition, London, london visual arts, LoVArts, National Gallery, Painting, Peder Balke, Review. Bookmark the permalink.